My Brand new Grandson was adopted into our family and RJ is now with his FOREVER FAMILY. Big Brother James is Thrilled! RJ was a pre-birth adoption and my DD and SIL brought him home from the hospital 10 days ago! 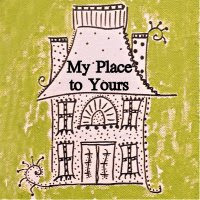 This little jewel is going to hang on the side of my new Grandson's crib! Black, White, and Red make the best color contrasts for infant eyes, especially those first few months. Did you know that? Pattern is "Great Granny Block"
Riley Blake Gingham...is there any other kind?? Mrs. Solley's Quilt is in the pinning stage but you get the Look! This Quilt GREW...and GREW...and GREW!!! re-ordered...do you ever change your mind from an original idea? Look at That Gingham Binding! I found this apron in a bag of aprons that belonged to a good friend's mother who passed away. 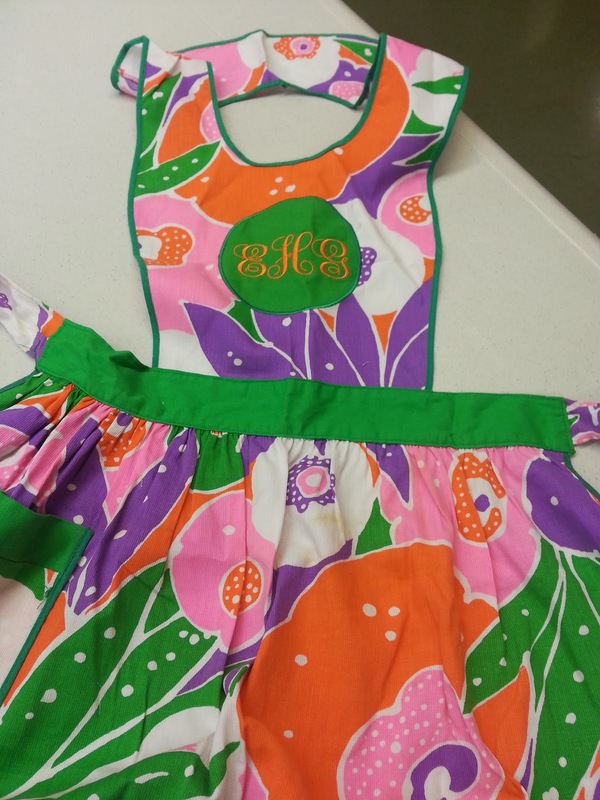 Once my friend Jan monogrammed it after I altered the apron to fit E.G., it was perfect and she loves it! oops, picture is blurry...these are so fun to make. 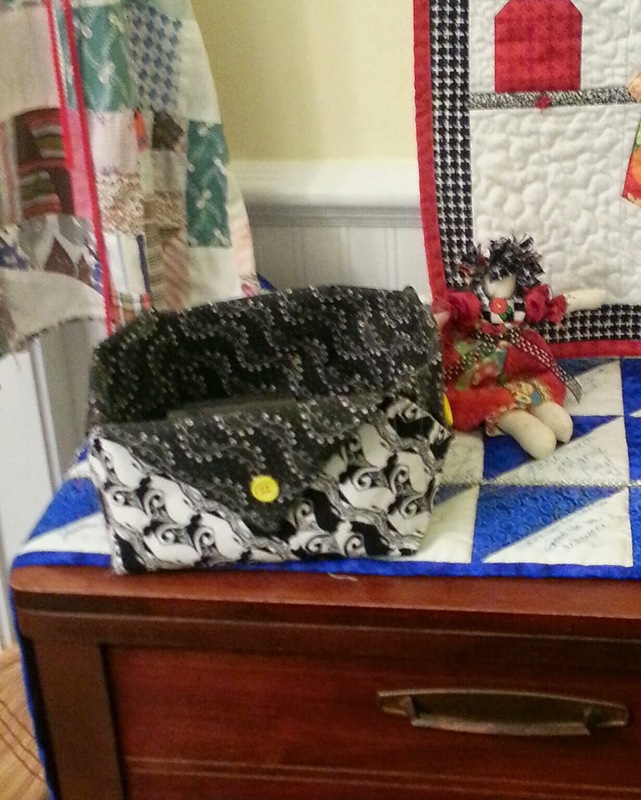 Mini Quilt in Hangar is from Sharon Vroomsman in a Doll Quilt Swap! Isn't it adorable? I wish I could claim it but alas I can not....paper piecing is NOT my gift! I made this for another Doll Quilt Swap Partner. FOR MAKING SEE YOU IN SEPTEMBER HAPPEN! These Ladies are Top Notch and ALWAYS inspire me to do better, try harder, try new things, enjoy the journey, and cheer everyone onward and upward! Lovely projects! You have been very busy this summer! 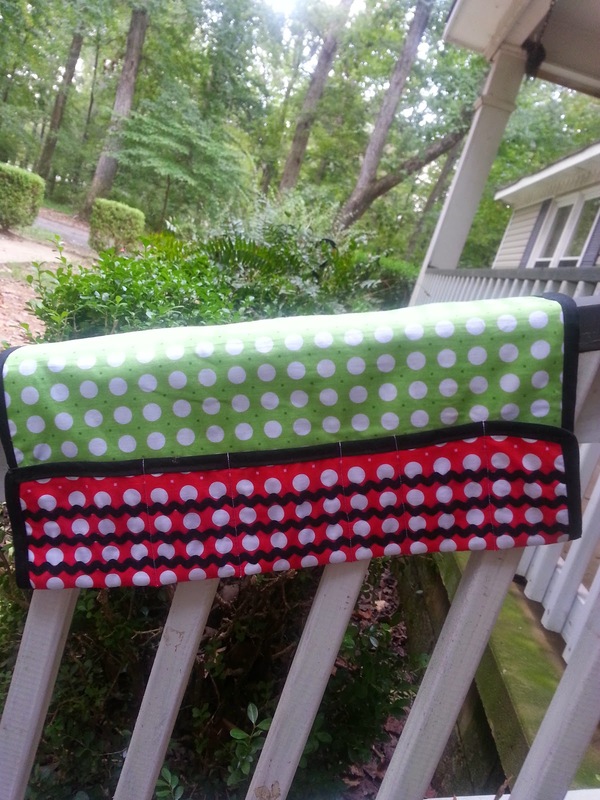 So/sew many cute things you've made Jane ! I am going to make a black and white and red something for my new Grandson to look at ...I did not know that ! Don't grandson's just steal a Gmama's heart ! What a wonderful Summer you have had and a new Grandson, what a blessing! Love all of your fantastic projects, and of course the yummy goodies that you have canned and froze. Thank you for sharing. Tell me, did you sleep at all during summer? Or was it raining all day long? Youd did soooooooooooo many fantastic big quilt and small things, I really don't know why one I like best!!! Fantastic! Oooooooh my! You had a busy summer! 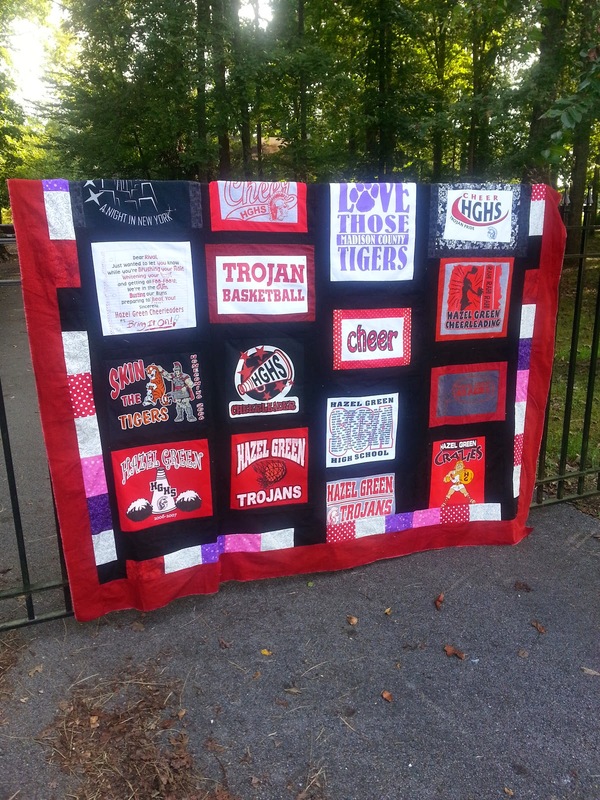 I love all your projects, but the teachers quilts are so much fun that I may have to steal that idea! Love it. Congratulations on you new grandson! And to answer your question. No. I never ever change my mind midway through a project. Just like I never open the door to visitors with threads all over me. Or stand at an airport security check trying to find out why I am beeping....and then see my thimble still on my finger. Never happened. I am WAAAAY to organised for that. Thank you for sharing all your awesome projects! 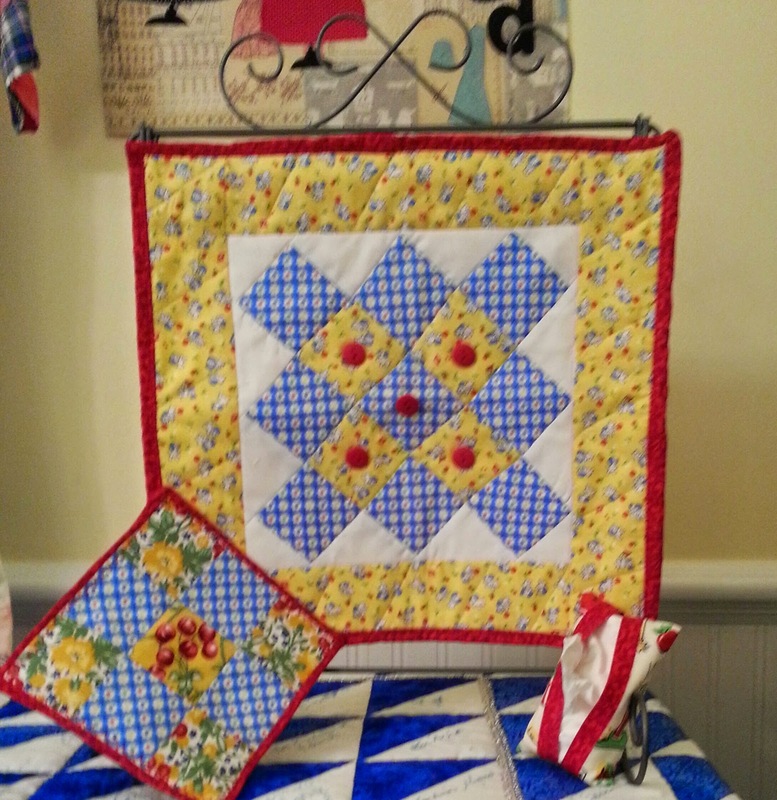 Beautiful quilts...great gift for your new grandson too! This has certainly been a summer for sharing...lovely gifts; very thoughtful! Congratulations on the arrival of your new grandson. How exciting! 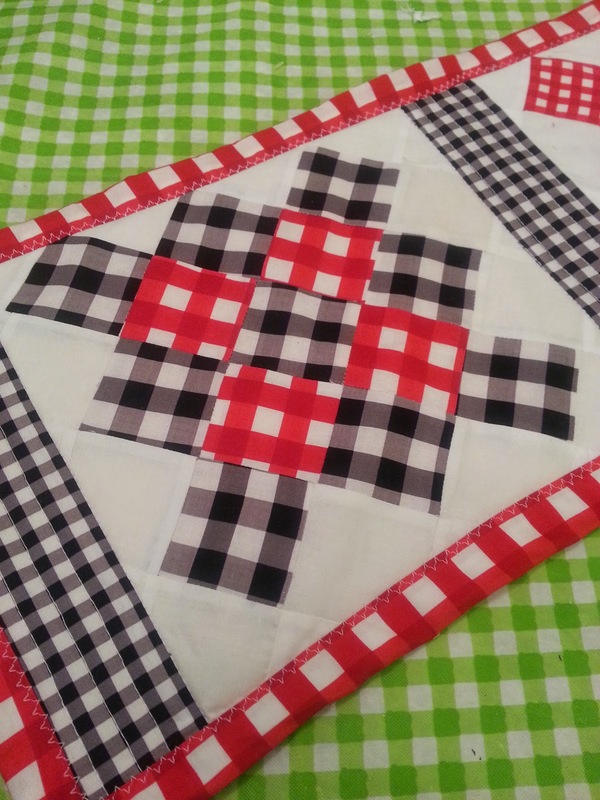 What a productive summer you have had...your quilts and quilty projects are amazing. Love those hand quilts...awesome! You have been busy making one gorgeous piece after another! Congrats on the new grandson. Unbelievable amount of beautiful work! Congratulations on you grandson! What great projects, and lots of them! Congrats on the new grandson!! I thought I was busy!!! 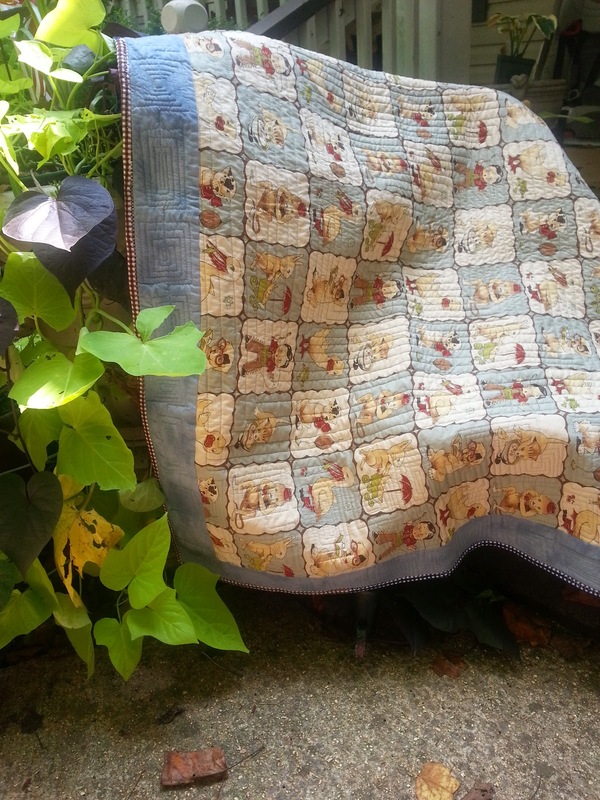 Love your stories and your quilts and other projects Re just wonderful. Your new grandson will be so lucky to have you and his quilts. What an excellent summer you've have had. Your projects are fabulous! Love the hands, such an awesome teacher gift. Gratz on the new grand baby! How exciting. Wow you really got a lot accomplished. Live every piece. But really like the t-shirt quilt. Really enjoyed every piece. You were extremely busy! Just love all the projects but absolutely adore the baby quilt for Baby RJ. Oh, my goodness Jane! You have been so busy making all those beautiful quilts!!! You are such a treasure for your family! Congratulations on the new grandparent! What a lucky little boy!!! Congratulations on the newest addition!!! You've done a great job on your summer projects. They are all lovely. Beautiful projects and congrats on the new grandchild!! So many things to comment on, my favourite is the lovely quilt for the new baby. So many great projects, my head is spinning! I adore the handprints -- when my kids were small we did a whole wall with their painted handprints. I would love to do a quilt like that for the grands! Wow Gmama, you've accomplished a lot this summer! I like the look of the gingham binding. Thank you for sharing, and congratulations on the new grandbaby! So many beauties here, and congratulations on the new baby!! You really had a busy summer...wow, so many amazing projects! Congratulations on the new baby who will look adorable on that beautiful quilt. I love the fabrics! And congratulations on your new grandchild.They are just adorable, arn't they. 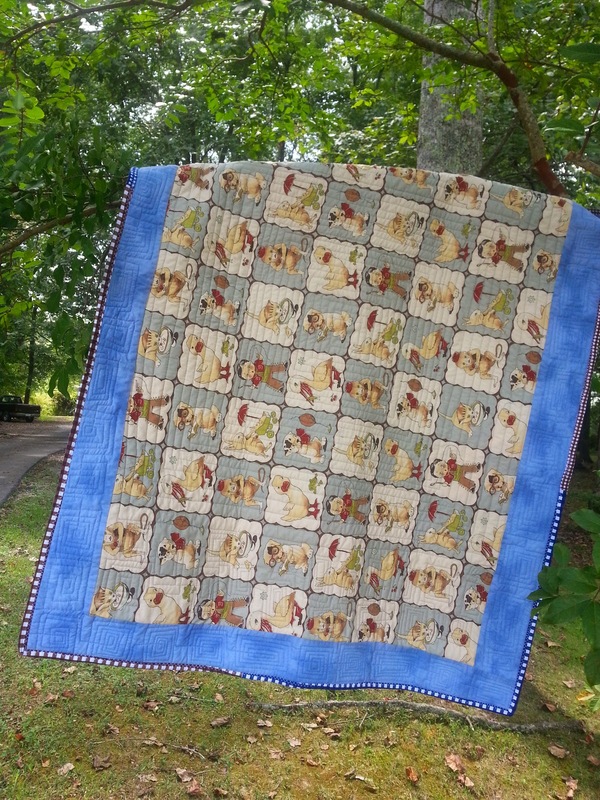 Well I don't know what happened to my first post~ Tour New Grandson is very lucky to have this Gorgeous Quilt!! The Red, White and Black design looks like it was weaved, very unique!! Those colors were popular for baby eye candy in the early 80's when my eldest was born. Thanks for Sharing all your wonderful projects!! Wow So many beautiful projects! I really love your quilts. The new baby will love to roll around on his, I am sure. And I love the teachers quilts. This is such a wonderful gift and something she will cherish always. Thank you for sharing all your beautiful work. First of all...I LOVE the vintage baby quilt!!!! That is 100 % Cute!!!! From there on it is ALL SUCH GREAT EYE CANDY!!! You are a fabulous QUILTER and I just loved LOVED it all!!!! Congratulations on your new grandson!!! 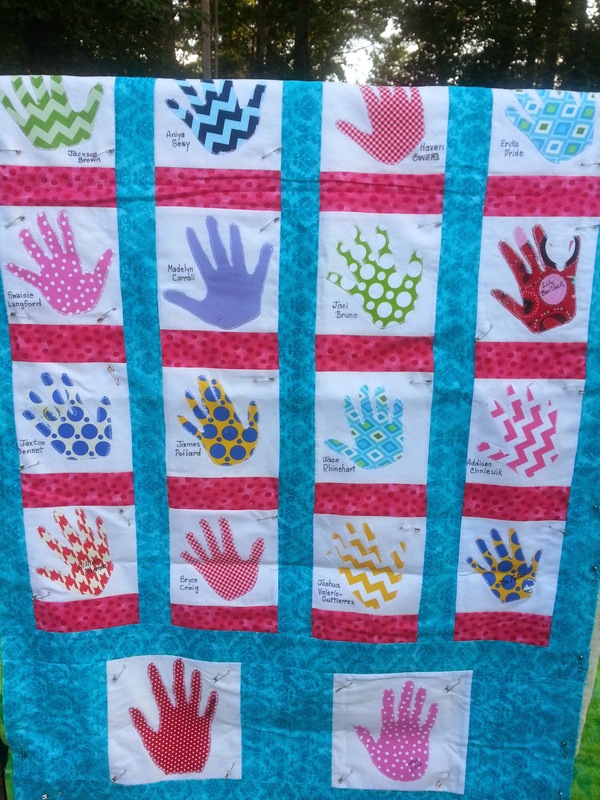 Awesome quilts - baby is so adorable and I certainly wish I had received a quilt with hand prints from my students!!! Great eye candy all the way through this post - just the norm for you!!! What a busy summer you had. All projects are fabulous. Congratulations on your new grandson. How exciting! My gosh you had a busy summer. You must have a real sense of accomplishment! Thanks for sharing all your great projects. So many projects and they are all so pretty. You sure wrre busy this summer, I can see how you didn't get the teachers quilts finished. I love your t-shirt quilt. That is one I never made yet...IT is on my wish list. I thought Grandmothers were supposed to rest a little. Such beautiful projects and thoughts. you have been so very busy during the summer, I think your days have more than 24 hours !? Wonderful projects, thanks for sharing! 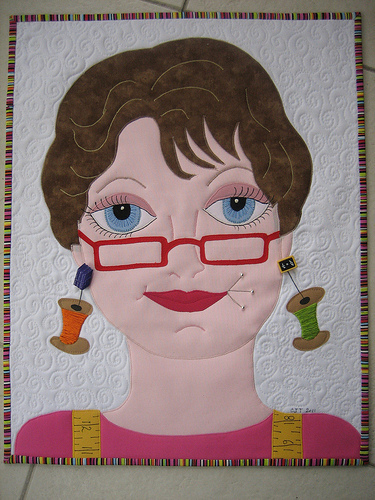 You have really been quilting up a storm. 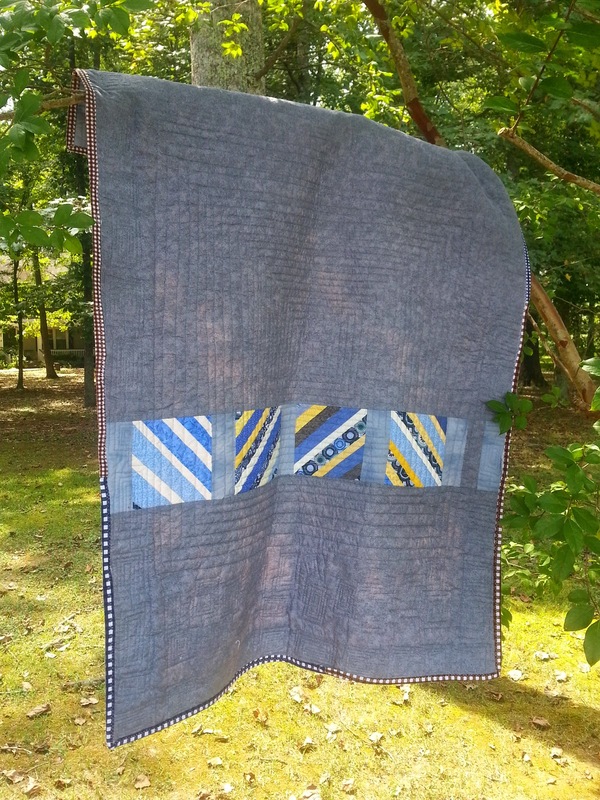 All of you project are great, I really love the hand quilt you did, been planning to do one for a friend of mine for the past year. 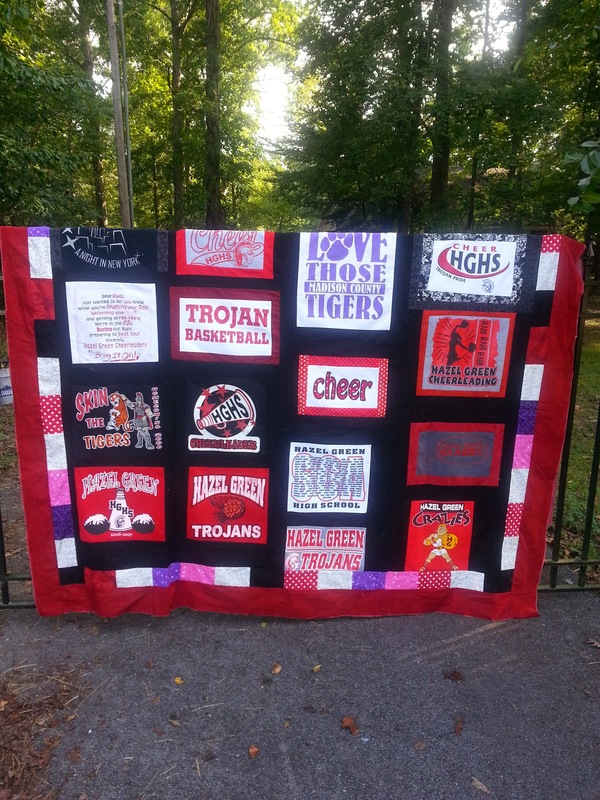 And the t-shirt quilt is just great, I have some t-shirts a co-worker gave me to put together for her when I have time. 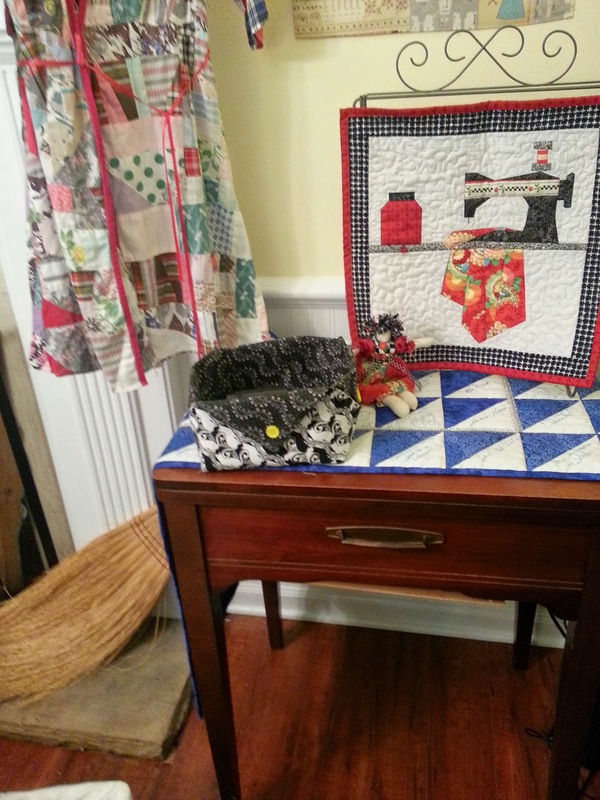 For goodness sakes, you have had a busy sewing/quilting summer. BTW, congrats on the new grand. He should feel loved by grannie with all those grand projects. Never heard that about red, white, black colors for newbies - the gingham worked bout perfectly. September? That looks like several years of work. 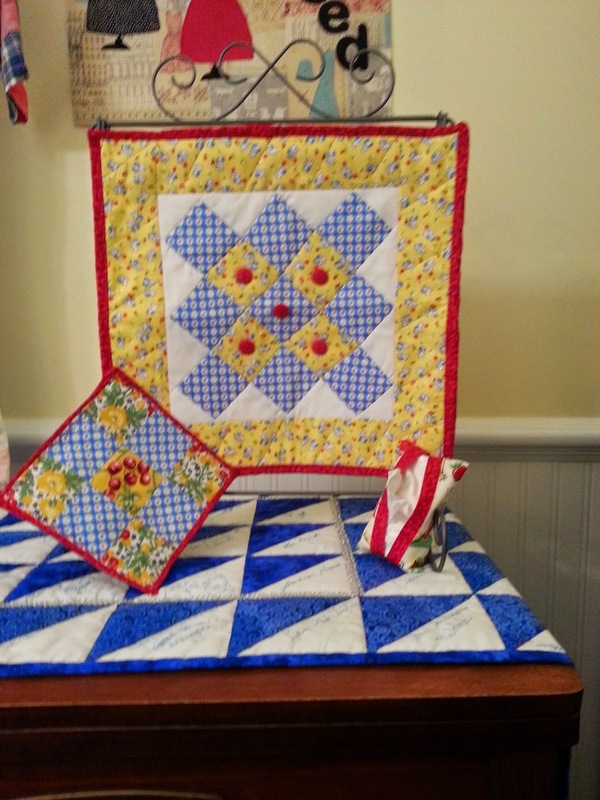 I especially love those quilted pieces to welcome the new little brother. I guess Grandmama is off her rocker and at the sewing machine. Each project shows you had a wonderful summer stitching. The quilts are truly gorgeous! Geez you've been busy! Congratulations on the new grand baby. Nothing better than sewing for a grand baby! All of the projects are wonderful! You were one busy quilter this summer. Love all of your wonderful projects. 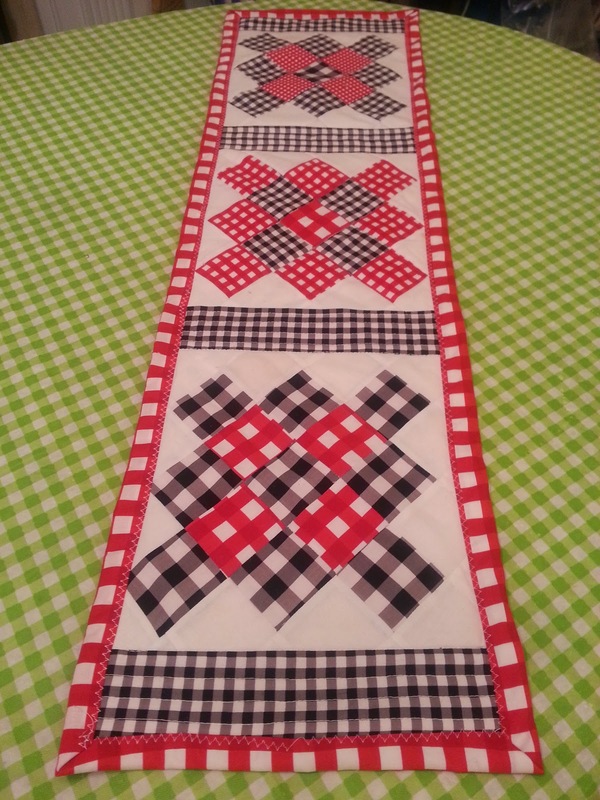 Love the red, black, and white gingham table runner. Wow, you have been a sewing MACHINE...lol You really inspire. I love the baby runner. That is definitely baby eye candy. 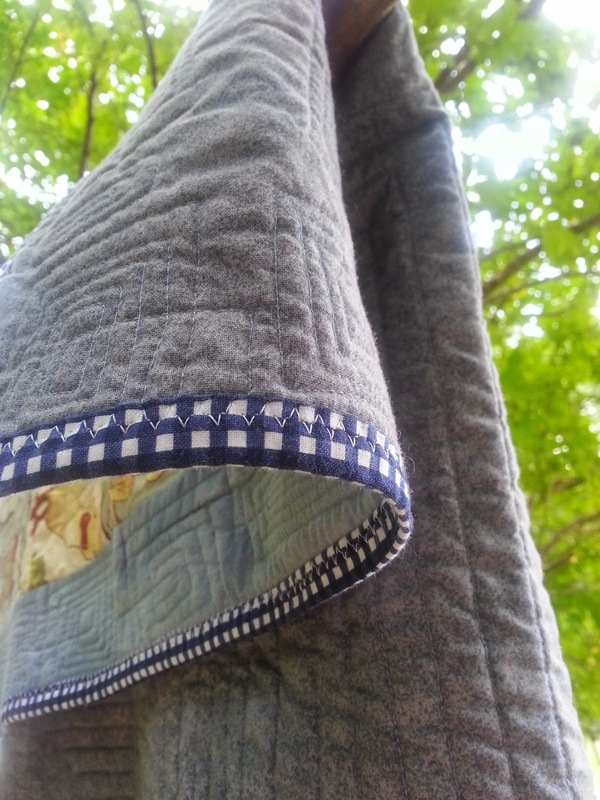 Your baby quilt is precious and those teacher quilts are so cool. All of your creations are wonderful. Great job, Jane! You have been very busy! All of your projects are fantastic.. If I were made to choose a fave, it would be the tshirt quilt. That is going to be awesome! You've had a very productive summer. All this sewing AND gardening? 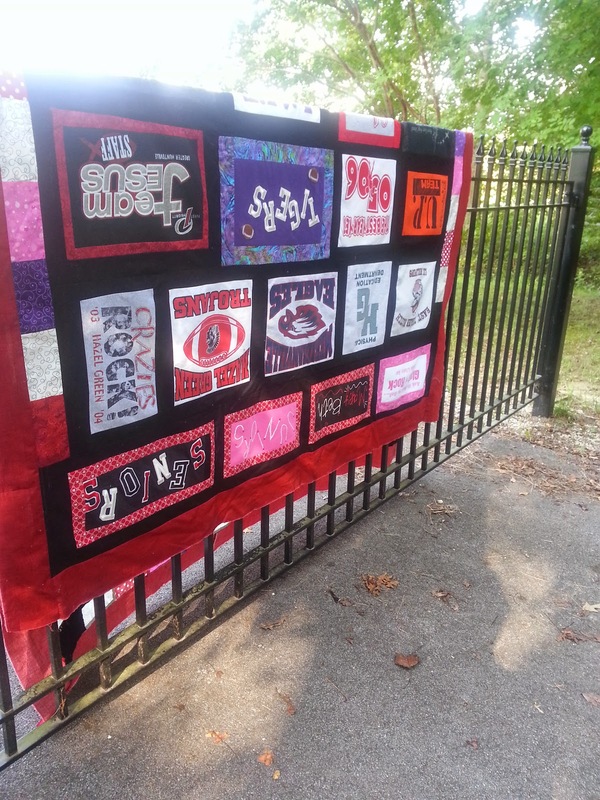 Nice idea for the teacher quilts. What special gifts they will make. 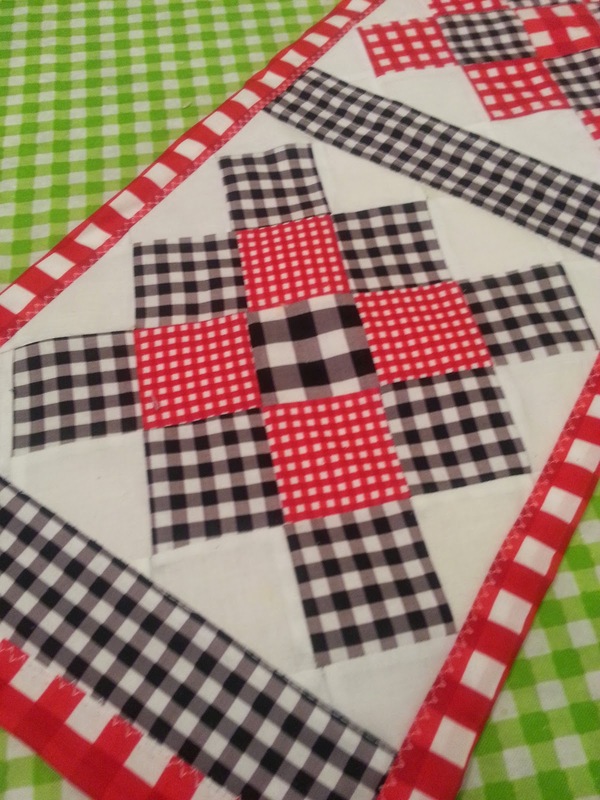 I love the gingham binding on the vintage sports quilt. Phew! It looks like you've really been busy. And congrats on the newest addition to the family. Another child finding his forever family is the best thing of it all. Wow you got a lot finished. 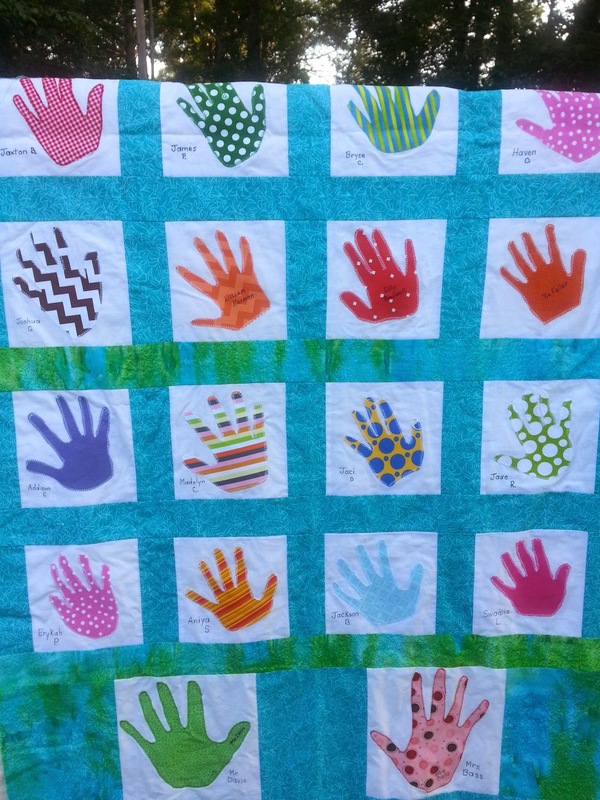 The handprint quilts with the names of the kids is incredible. What a labor of love. You sure were/are one busy retired lady! 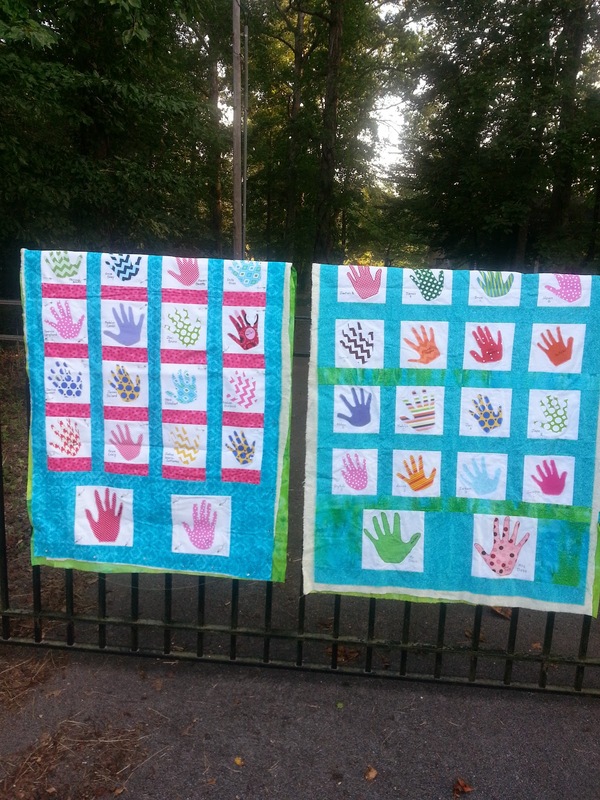 I love the handprint quilts an know the recipients will as well. Congratulations on the new grandchild and thanks for sharing your many creations with us. wow, Jane! What a busy girl you were on your supposed summer vacation. How sweet of you to make classroom quilts for the teacher and the aide. I've made about 7or 8 t-shirt quilts and they always grow like topsy to queen, king easily. Always a fun stop when your blog is on the list. SEE YOU IN SEPTEMBER BLOG HOP IS HERE!!!! !